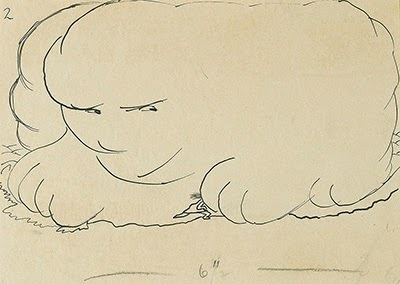 The four original illustrations by celebrated American humorist, cartoonist, author, and journalist, James Thurber (1894-1961) to accompany Charles Kingsley's poem The Sands o' Dee, as published in The New Yorker magazine March 25, 1939, have come to auction. 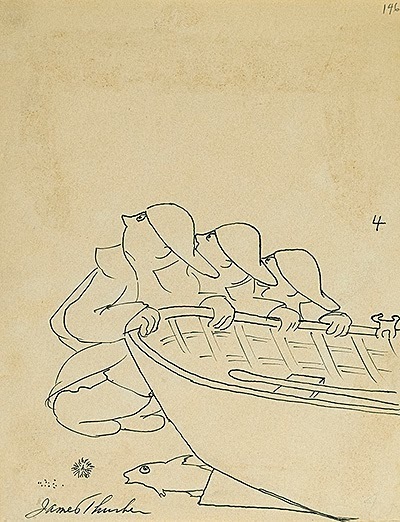 Offered by Swann Galleries in its 20th Century Illustration sale January 23, 2014, they are estimated to fall under the hammer at $4,000-$6,000. Across the sands of Dee." Each original illustration is 279 x 216 mm (11x8 1/2 or smaller). 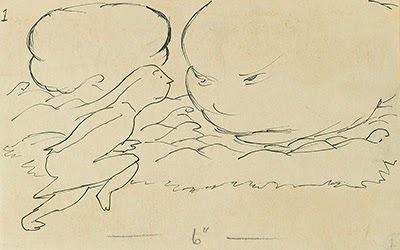 Thurber's signature appears at lower left on the final drawing. 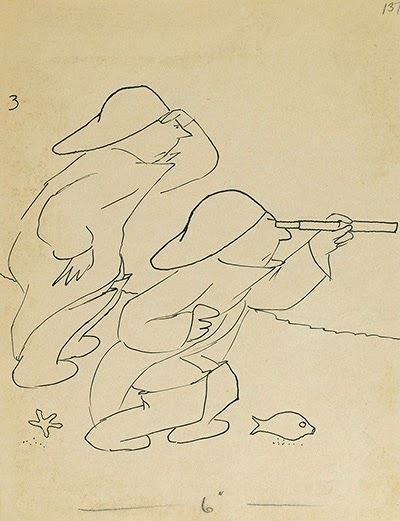 Three of the illustrations possess faint preliminary drawings on their versos. Thurber illustrated nine poems for The New Yorker, the others being Excelsior (Henry Wadsworth Longfellow); Lochinvar (Sir Walter Scott); Locksley Hall (Lord Alfred Tennyson); Oh When I Was ... (A. E. Housman); Curfew Must Not Ring To-Night (Rose Hartwick Thorpe); Barbara Frietchie (John Greenleaf Whittier); The Glove and the Lions (Leigh Hunt); and Ben Bolt (Thomas Dunn English). They were collected in Thurber's 1940 anthology, Fables For Our Time and Famous Poems Illustrated. With an affectionate tip o' the hat to Thurber keeper of the flame, fanatic and collector, Jay Hoster, who knows more about the man and his books than anyone alive. Sands o' Dee reprinted via WikiSource under the Creative Commons Attribution/Share-Alike License.